Latin America has been receiving a lot of British foodie love of late. What with the fact that you can't walk down a high street without tripping into a burrito van and restaurants like Lima (review coming soon) showcasing the finer end of the area's cuisine. And, of course, there's tequila, pisco and cachaca, a spirit which ten years ago entered our collective cocktail consciousness in the form of the caipirinha. But Colombia has largely remained one corner of South America whose notorious reputation has not been softened by an introduction to its epicurean culture. That could be set to change with the launch of La Hechicera rum in the UK. La Hechicera (pronounced La Etch-i-say-ra) means The Enchantress and was founded by the Riascos family two decades ago; it is the only family owned and pirvately held spirits company in Colombia. And if the sensuous, sophisticated hedonism of the launch party last week was anything to go by, we will all be holding love-ins for Colombia before the year is out. 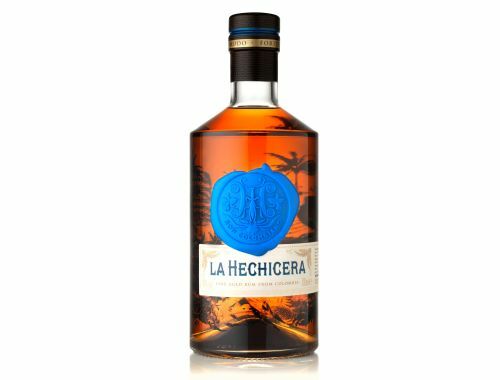 La Hechicera is a blended rum made in the tropical northern region of the country, a lush area nestled between the Magdalena river and the Caribbean near the industrial and shipping hub of Barranquilla. Aged from 12 to 21 years in Amerian white oak, the spirit is made in small quantities to exacting standards. Sourcing the finest sugarcane and aromatics from around the country this fine rum is carefully crafted and left 'unpolished', meaning it has not been finished off with sugar to round off the flavour of the wood in which it has matured. The result is a very smooth rum, either on its own or in a cocktail. The deep woodiness is sweetened with a note of toffee and a pleasing coffee aroma while hints of orange peel give it a liveliness that slips down very well. La Hechicera retails at £38 but is still hard to find as the brand's owners get to know UK spirit retailers. However, it is slowly appearing in discerning bars. If you do manage to get hold of a bottle here are a couple of cocktails I tried at the launch, both of which were delectable. "But Colombia has largely remained one corner of South America whose notorious reputation has not been softened by an introduction to its epicurean culture." - it made my day!